We're talking musical bass here, electric and acoustic--deep, low, and powerful, the low-frequency foundation that gives most music its rhythmic drive and pulls us into its ongoing momentum. Bass is innate, and primal, and seems to be almost part of our soul (soul music?) so getting it right is as important to the enjoyment of home theater as it is to just plain music, whether you listen in 5.1 channels, 6.1 channels or in two stereo channels. Without good bass, music sounds anemic and undernourished, robbed of its very foundations. 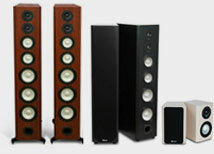 Axiom speakers, certainly the big ones (M80's, M60's) pump out bass in fairly large quantities in average rooms, and even the modest speakers, like the M3ti and M22ti, do a creditable job on lots of music. But when you head for the home theater or you want to fill a bigger room, especially with dinosaur-type footfalls or the convincing war effects of movies like "Saving Private Ryan" or "Black Hawk Down," most of us opt for a subwoofer. The sub handles all the serious low bass, letting your main speakers (and center and surround speakers) do their best job with upper bass and the midrange. 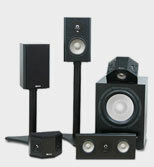 With subwoofer assistance, your mains, center, and surrounds will play louder, with less strain. 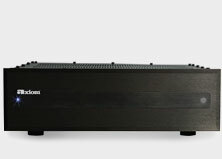 And the subwoofer's power amp relieves your receiver's amplifiers of supplying all those watts for watt-hungry low-bass effects, allowing your receiver's amplifiers to "coast" with the fairly modest power requirements of midrange and upper-bass frequencies. So we all win. But the trick is getting the blend right, and with home-theater setups, it's frustrating and at times seems almost impossible. Help is at hand in the form of a remarkably well-produced and complete home theater and stereo set-up DVD: the Sound&Vision Home theater Tune-Up (DVDI 0790), published by Sound&Vision magazine and Ovation Software. If you aren't aware of it or haven't seen it, you should check it out. Even for an avid enthusiast, it's useful, and--as impossible as this sounds, it's actually entertaining! Although this may seem like a shameless plug, it isn't. The DVD's audio test signals were developed by Sound&Vision Technical Editor David Ranada (an old friend and former colleague of mine). He is one of the best-informed individuals around on the subject of digital processing, home theater reproduction, video, and acoustics. The co-producer of the DVD is Ovation Software, who did the original Avia video alignment disc, heretofore one of the best video and audio alignment DVDs available. Each time I use the Sound&Vision DVD, I find new information. It's hosted by an engaging Bill Paxton-type actor "Dave" and an agreeable non-shrewish actress, who plays his significant other. Together, chapter by chapter, and in easily understandable language, they go through the process of connecting your A/V receiver, DVD player, subwoofer, and five or more satellite speakers, as well as all the video connections, optical and coaxial digital links, and the analog audio hookups. And there are really clever demos to show the difference in video quality between S-video, composite- and component-video connections as well as concise explanations of interlaced and progressive-scan TV displays, High-Definition TV standards, and compatible progressive-scan DVD players. 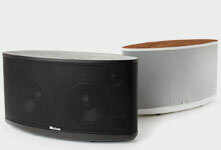 If anyone can make setting up those pesky subwoofer crossover frequencies entertaining and engaging, this pair can. Even little known facts--like setting your subwoofer's crossover control to its maximum position to let the receiver's built-in crossover work unhampered--are not overlooked. And some excellent basics about how to set the system menu for all your home theater speakers to "Small" or "Large" are also covered. 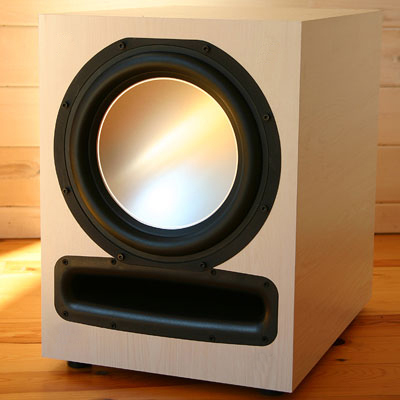 Basically, any main, center-channel, or surround speaker using woofers smaller than 8 inches should be set to "Small." Now that's easy to remember! Ever had the feeling that maybe, just maybe, not all your speakers are "in phase," their woofers perhaps not all pushing and pulling air at the same time along with your subwoofer? No problem. The test signals gradually check phase with the sub and between every speaker in your system so you can check 'em all. And the tests for setting the subwoofer crossover frequency and level are the best I've ever encountered. You can do the tests by ear or, even better, with Radio Shack's inexpensive Sound Level Meter. There are even clear directions on the DVD on how to set up and use that invaluable accessory (it's about $35 or so at Radio Shack stores). You can access test tones for 6.1-channel systems and dts test tones as well. And excellent graphic animations illustrate proper surround, main-channel, and subwoofer speaker placement. I haven't talked much about the TV and video display alignment tests, but the DVD is even supplied with a blue filter to perform the color calibrations by eye. And who coudn't use a better-looking TV picture? Most consumer sets are badly misaligned right out of the box! If you're still confused about DVD movie and video-display aspect ratios and anamorphic formats, this disc will set you straight. How to get hold of this excellent setup DVD? It's available on-line from a number of sources, including Barnes & Noble.com. The DVD's suggested retail price is $19.95 (US). 1. Buy Blackout Curtains to Darken the Room for Optimal Picture Quality If you are watching front projection images on a large separate screen and there is light in the room, you won't believe how much better your big-screen images will look—snappier contrast, blacker blacks and richer colors-- once you truly darken the room with blackout curtains.